Do you have a minute to spare to learn some English? 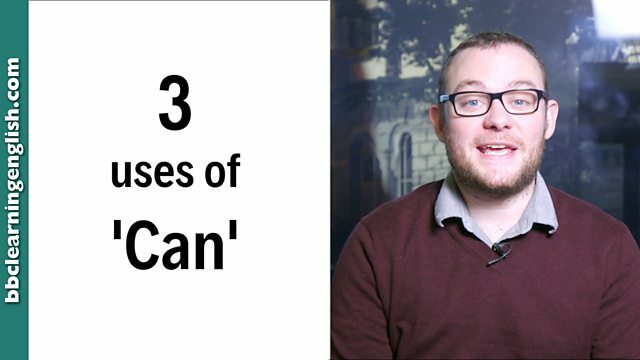 Can James tell us 3 uses of can? Of course he can! Give us 60 seconds and we'll give you the English! Welcome back to English In A Minute. I'm James and today we're going to talk about a word with lots of different uses: can. I can play the guitar. This is the first way that we can use can – to talk about ability. For example: I can speak Spanish, but I can't fly. Let's look at another use of can. Can I open the window, Elly? No, you can't! It's too cold! Oh, OK! In this example, can is used to ask for or give permission to do something. Can I go for lunch, Elly? Yes, of course you can, James! Learning a language can be difficult. In this final example, can is used to talk about possibility. Elly take a jacket. It can get cold at night! This means that sometimes it is cold, but sometimes it isn't. So there we have it. Can can be used for ability, permission and possibility. Now you, can use can too. See you next time! Can is a modal verb. This means it doesn't change its form regardless of time or subject pronoun. It is always followed by a bare infinitive verb. Can is often used to talk about an ability or something we are or aren't able to do. I can speak Spanish but I can't fly. I don't think I can afford that much money. He can't admit how he feels. But he loves you. Can is also frequently used to ask or give permission to do something - or say that something is forbidden. Can I go for lunch? You can't smoke here, I'm afraid. Tell her she can leave as soon as she's finished. Can is also use to say that something is possible or impossible. It can get cold at night. They can't be 60! They look so young. Give John space when he gets home. He can be a bit grumpy after work. Can is a modal verb... what difference does that make? Someone is asking for something - what's another way of saying 'asking for something'? Which use of can is this: Have you seen John? I can't find him anywhere. Context is very important with can. There could be more than one answer! Which use of can is this: Can you help me? I don't know what I'm doing.